Salvation And Survival: What Is REAL Courage? You know, with all the alerts from around the world warning us that evil is encroaching upon our security, it would be easy to give in to the unsettling fear and worry. I'm afraid that, as a culture, we have lost the sense of self-preservation and the responsibility to protect ourselves that was a hallmark of our ancestors. Are courage and heroism no longer desired traits? We seem to have exchanged our instincts to defend and safeguard ourselves and our families for the idea that others will do it for us (like the government) -- or even more ridiculously, that it will never reach our shores. Then again, we have become a society that puts more stock in the perceptions and interpretations we see on our TV and movie screens than we do in our own lives. 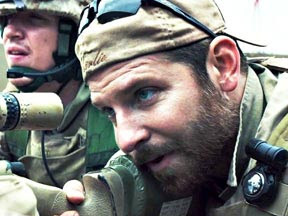 We sit back and watch celebrities play real-life characters in movies like American Sniper and the upcoming 13 Hours: The Secret Soldiers of Benghazi, and look upon those actors as heroes, relegating the stories of the actual men to two-and-a-half hours of whatever the screenwriter chooses to highlight. So, we are able to transfer those acts of courage onto a movie star, and give no further thought to the real struggles that those real-life heroes face -- or, even more importantly, how we might be called upon to respond in kind. That's why it sickens me when I see and hear the accolades heaped upon actors like Bradley Cooper, Liam Neeson, and Edward Norton (and the additional 97 celebrities who joined them) for signing a letter to the President in support of gun control. What are we to think of them? If they truly believe that "guns [are] far too easily available to people intent on doing harm", are we to assume that they lack a moral compass or conscience because they have no problem making millions of dollars playing characters who use guns to defend themselves, the weak, and the defenseless? Don't be mistaken -- I'm not looking to turn this into a gun control argument, although I do find their argument for enhanced background checks without logic -- as Breitbart.com states, "It is hard to figure out which is most embarrassing, the fact they cite a shooting where the gunman and gunwoman passed a background check for their handguns–San Bernardino–or the fact that they cite Sandy Hook, where Adam Lanza went around background checks altogether by stealing his guns." But, back to my real point -- It is that they don't deserve to be compared to the flesh-and-blood heroes they portray; nor do I think they comprehend what lies at the foundation of real courage. Let them spend one day, even one hour, in the shoes of men like Chris Kyle, or Glen Doherty, or Tyrone Woods, and maybe... just maybe... I would listen to what they have to say. Instead, let them visit with Jeff Struecker, a real-life survivor of another blockbuster movie, Blackhawk Down. Maybe it is easy for actors, once the cameras stop rolling, to discard the persona of the dead men they are playing. But let them hear Jeff Struecker tell his story of what it was like those fateful hours in Mogadishu, as the Army Rangers/Delta Force attempted to secure the area after a UN peacekeeping mission went awry in the middle of Somalia's civil war. Let them hear, first-hand, how Ranger PFC Todd Blackburn failed his fast-rope drop-in and fell 70 feet to the ground headfirst. Let them experience the horrors that surrounded the Rangers and Delta Force operators, as they secured the perimeter, and how the subsequent efforts to rescue the fallen ranger led to two helicopters being shot down and 18 deaths. Let Struecker relate how he rescued Blackburn, who was unconscious and bleeding through his nose and mouth, and stretchered him to a Humvee that would drive him to the base; how he drove carefully through the alleys of Mogadishu, so as not to jar the injured soldier. And then, let them try to imagine what it was like as Struecker paints them the following picture: "Turning a corner, the entire city erupted with gunfire. We were being shot at from a 100 different directions, it seemed like—from rooftops, from alleyways and from doorways and windows. There were rocket propelled grenades and automatic gunfire from AK-47s from 20, 30 feet away." Rear gunner Sgt. Dominick Pilla was killed by a militiaman waiting in ambush. "When I turned and looked over my shoulder, it looked like the whole back of my vehicle had been painted red with Dominick Pilla's blood," says Struecker. "I thought I was going to die in the next moments, but then I remembered I was in charge and I needed to get myself under control if I was going to get my men out of there." It is one thing to play those emotions as an actor; it's quite another to actually live them. But here is the part of the story that I'm fairly certain these actors cannot understand, and where the heart of what courage really is comes into play ... The column of Humvees managed to escape the hostilities in the city and return to the base. Medics and surgeons ran to stretcher in Blackburn. Meanwhile Struecker thanked God that he had gotten out alive. At that moment, the platoon leader informed Struecker that a Black Hawk helicopter had been shot down, and that the pilot needed Humvees to go rescue him. A special operator counseled him to wash the blood off the Humvee first so as to not terrify the new crew. As he washed the Humvee, he experienced convulsions of fear like he had never felt before. "I was totally and completely certain that I was going to die," he said. "And every fiber of my being was saying, 'No, Jeff, don't do this. This is crazy. It's suicide. You're going to get yourself killed if you go back out there.' But then he remembered he was a Ranger, whose creed is to never leave a fallen comrade to fall into the hands of the enemy. As a Christian, he started to pray. "God I'm in big trouble right now, and I need your help because I'm certain that I'm going to die tonight," he said. The Lord brought to his mind the recent Bible devotional about Jesus in the Garden of Gethsemane. There, Jesus said, "Not my will, but yours be done... Jesus, the perfect sinless Son of God, walked into the hands of the enemy and He willingly, freely gave His life up so that your sin and my sin could be dealt with once and for all," Struecker relates. "At the back of that Humvee, I prayed, not my will. From that moment on, God once and for all dealt with that fear. I had no worries about what was going to happen to me that night." I'm pretty sure that no Academy-award winning actor could accurately portray how that changed Jeff Struecker. "I realized if I go home to my family in Georgia or go home to my Father in heaven, in either case, I cannot lose because of what my Savior Jesus Christ had done for me. That alone gave me the peace to go back and forth into the streets repeatedly for the rest of the night." And that he did, miraculously avoiding death as an RPG bounced off the hood of his Humvee, and gunmen opened fire on him with AK-47s from point blank range. Note that it was the peace of God that gave Jeff Struecker his courage. That kind of courage doesn't come from the efforts of a man, and that is something these actors may never realize. But Struecker's fellow soldiers saw it, and wanted to know how he did it. They approached him, "Jeff, there was something different about you last night, and I want to know what it was,'" Struecker says. "For the next 24 hours, I had guys lined up to ask me about Jesus Christ because they could see the difference that He makes when you're getting shot at and when the bullets are flying." "Before that night, I thought you could transform the world through military prowess and national power," Struecker said. "But I realized something in Mogadishu, Somalia: There is only one force great enough to transform the world, and it is the Holy Spirit of the Living God through His Son Jesus Christ." And that's why, after counseling a large number of comrades shaken by death, Struecker realized God had something greater for him than "kicking in doors and slinging lead at the enemies of our country," he said. 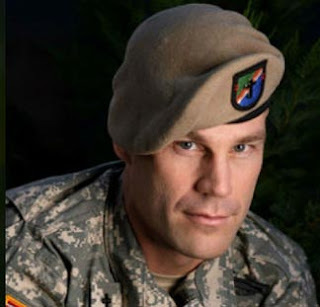 He became a Chaplain for his same Ranger regiment. And that is my definition of a hero. You see, Jeff Struecker learned what real courage was that night, and how to deal with his fears, as he experienced the tragedy that was Mogadishu. In the Bible, courage is the opposite of fear. When Struecker prayed for God's will, and not his own, we can see God working in each incident in those dark alleyways of Somalia. It was not natural for Jeff Struecker to be brave and courageous, but with God protecting and guiding him, he could have courage because he was confident in Him. That is something that only comes from knowing God. That is what allows a man to be called a hero. It will never come from "playing" a hero. What Jeff Struecker learned that night in Mogadishu is what each one of us needs to learn as we face the uncertain future and our own fears. We need to stop play-acting, and relying on our roles as Americans, or successful businessmen, or church leaders, or whatever part we're playing in our life's story. We need to allow God to replace that fear, and come to the understanding of His sovereignty, and that His plans and purposes cannot be stopped; that every circumstance of life is subservient to His will. I began this post by saying that it would be easy to give into our unsettling fears and worries, and that we have lost the sense to defend ourselves. But we must realize, as I believe our ancestors did, that God is our defense and our shield; that He is the one who makes it possible for us to do acts of courage because He takes away our fear and replaces it with confidence in His will and purpose for our lives. Real men, like Jeff Struecker, have experienced fear and overcome it with their trust in the will of God. May each of us experience that same Godly courage in the days to come.